Velvet Paw Creations: WOMEN RULE THE WORLD! - Art Nouveau card #2 for Lost Coast Designs! WOMEN RULE THE WORLD! - Art Nouveau card #2 for Lost Coast Designs! We are currently celebrating WOMEN in honour of Mother's Day over at Lost Coast Portal to Creativity! Join us every day as we countdown to Mom's Day on May 8th then enter your own female themed projects in the linky HERE by midnight PST on May 15 for the chance to win a $10 shopping spree at Lost Coast Designs and Carmen's Veranda! 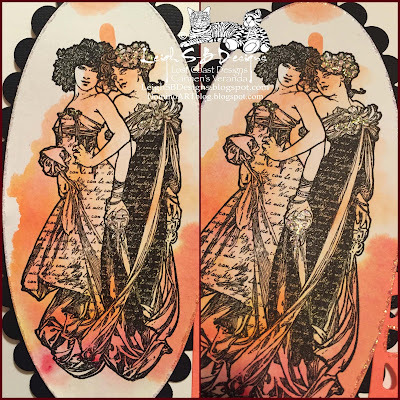 Lost Coast Designs and Carmen's Veranda have an extensive eclectic collection of female images guaranteed to suit your every taste and style...from Gibson Girls to ladies with wings and Fine Art to Manga....the list goes on! 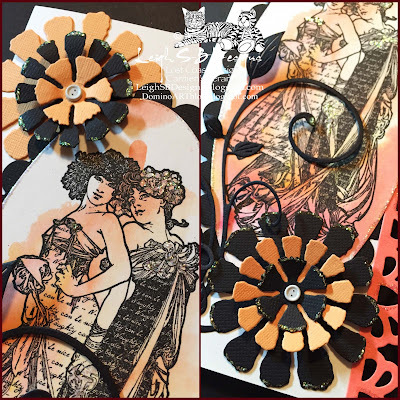 Stop by Lost Coast Designs and Carmen's Veranda and peruse our catalogues! 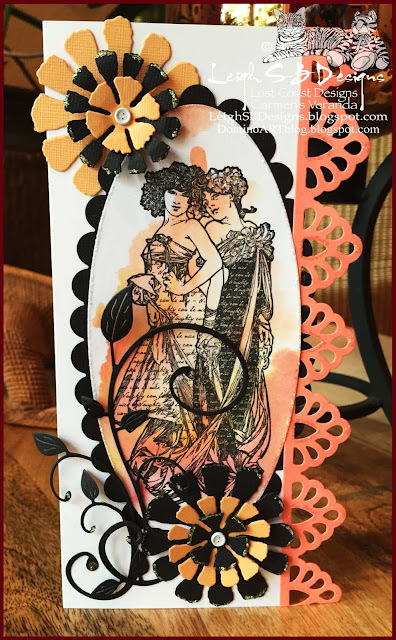 Yesterday I shared my Day 1 project and today for Day 3, I'm sharing my 2nd Art Nouveau inspired card featuring Lost Coast Designs Naughty Can Be Nice. Alphonse Mucha is my favourite Art Nouveau artist and we have a nice selection of stamps based on his wonderful paintings in our Art Nouvea and Art Deco Women section! The background was created solely with Nuance Powders by Magenta, now available in the LCD store! 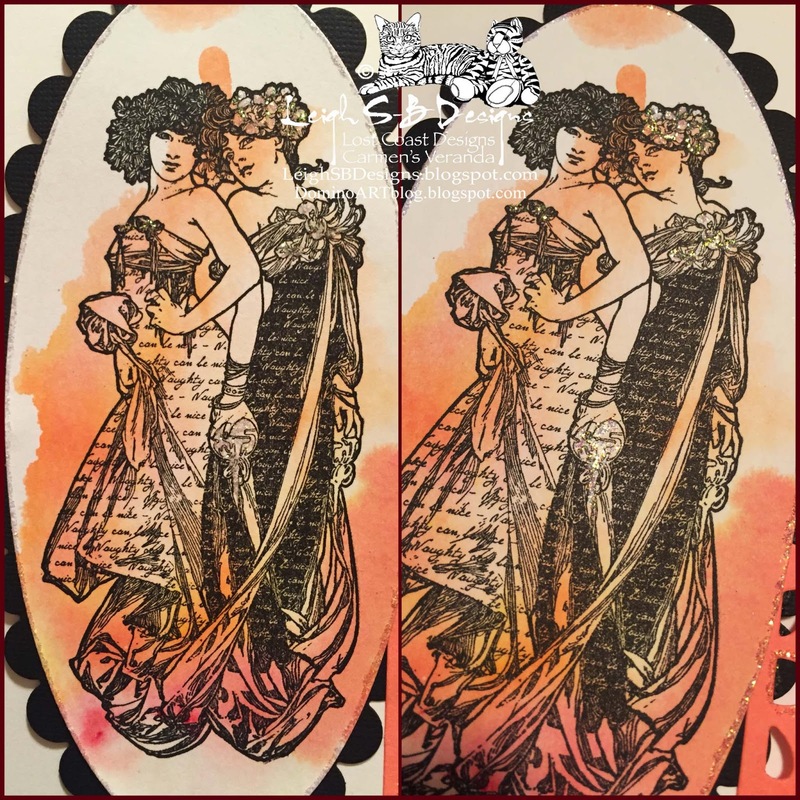 I used bright yellow, golden yellow, orange and red powders and the image was stamped with onyx black Versafine ink. I used dies to cut out all the components in various colour coordinating cardstocks. The leafy flourish is by Cheery Lynn and the rest are Spellbinders. Everything was adhered with Scotch Quick Dry adhesive. I used 2 tiny white button brads on the flowers and they were adhered with glue dots. I also used Diamond Stickles glitter glue for a touch of yummy sparkle. 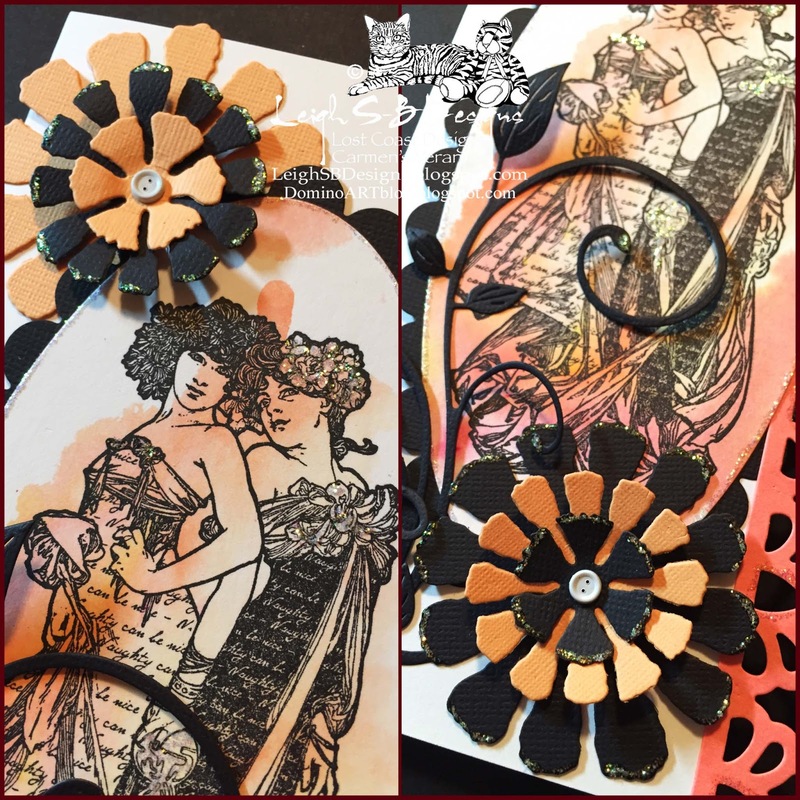 Thanks for visiting with me today, I hope I've inspired you to create with your feminine themed stamps and hopefully you've seen some Lost Coast Designs or Carmen's Veranda stamps you need in your stash as well...got to do my enabler part right LOL! 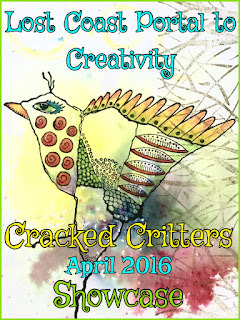 Before you go don't forget to play in our CRACKED CRITTERS SHOWCASE event for the chance to win the $10 prize, Mr Linky closes at midnight PST on May 7th!